Bead & Button Show In-Booth Demos! Stephanie Dixon and Debbi Simon! Stop by booth #533 to learn new techniques and designs! PROJECT #1 – Say “I DO” to Crystal! Project #2 – New Designs with Beadelle! Using simple wire techniques to add a bit of ‘pave’ elegance. Debbi Simon is an award winning designer, teacher and author, working creatively since 1993. Her original jewelry designs have been published in national and international magazines and numerous books. Her first book “Crystal Chic” was released in December 2008. She is a CREATE YOUR STYLE – SWAROVSKI ELEMENTS Ambassador and currently teaches workshops nationally using SWAROVSKI ELEMENTS. Visit MO at the Bead & Button Show 2011! in Milwaukee, Wisconsin on June 9-12! Come visit us to see what’s new in the world of Swarovski Elements and The Beadelle Collection! 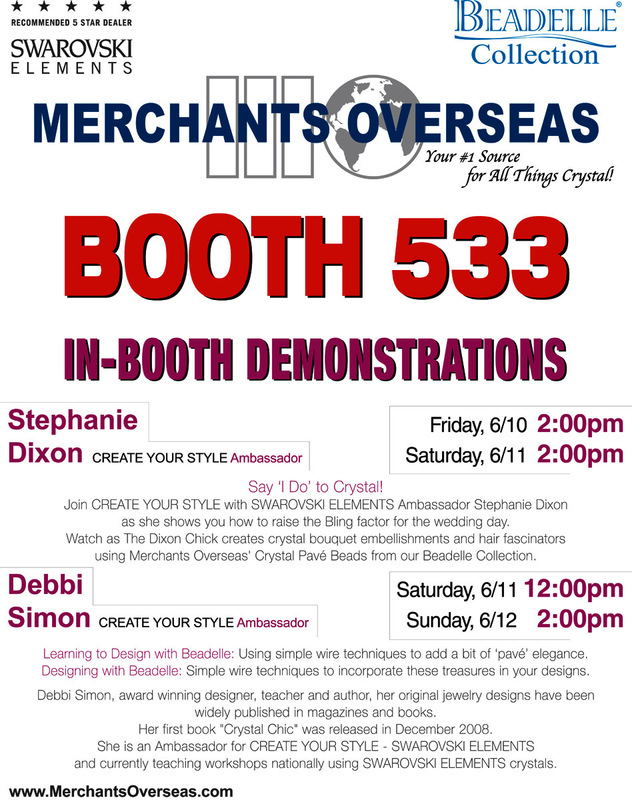 Stop by for an in-booth demonstration with CREATE YOUR STYLE Ambassadors Stephanie Dixon and Debbi Simon! Mother’s Day SWAROVSKI ELEMENTS “Dazzling Hearts” Bracelet! 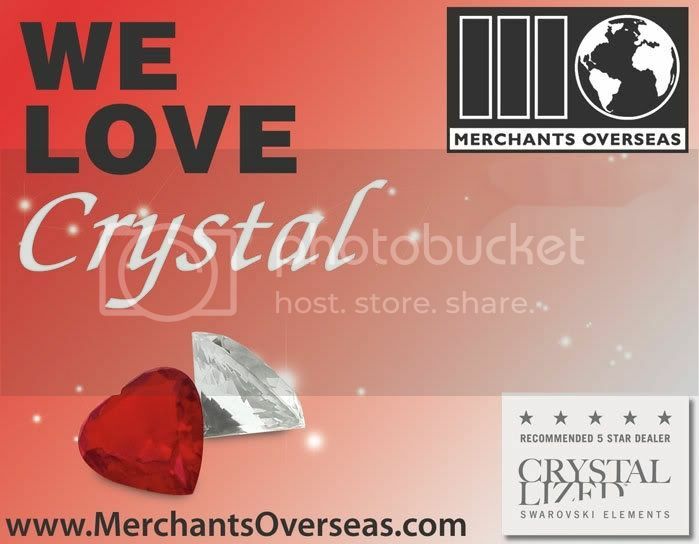 Visit Merchants Overseas for the all NEW Instruction and Design Guide for Mother’s Day! Featuring the ‘Dazzling Hearts’ Bracelet with SWAROVSKI ELEMENTS! 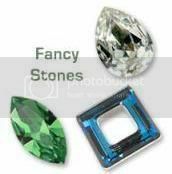 Don’t forget to visit the Create-Your-Style with SWAROVSKI ELEMENTS section of the website for many more design and inspiration guides! Free Freight on Tuesday, December 21st! Get The New 5752 SWAROVSKI ELEMENTS Clover Bead in Fern Green! The Clover Bead is one of the new Innovations from the SWAROVSKI ELEMENTS Autumn/Winter 2010-2011 Innovations. This bead captives by its new romantic and naïve shape. It evokes childhood memories and is reminiscent of good luck symbols. It can be seen as a collectible item as a lucky charm, most suitable for accessories, jewelry and DIY. The fact that you can now pre-order the item in Fern Green, is an amazing opportunity for St. Patricks Day and other earth-inspired designs! This New Create Your Style with SWAROVSKI ELEMENTS Instruction guide shows a unique way to use the very popular 5301/5328 bicone beads. Normally thought of as a spacer bead to be used in between other statement beads, this Sailors Knot Napkin Ring uses the bicone beads almost like seed beads. Used together, the beads make a statement on their own! Learn How to Make a Sailors Knot Napkin Ring Here! 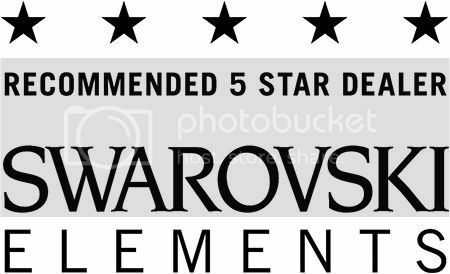 10% Off SWAROVSKI ELEMENTS 5328 Bicone Beads! The Bicone Bead is the most popular selling bead because of the versatility its double cone shape and multiple facets bring. These beads make great accent beads and fit perfectly in between many other SWAROVSKI ELEMENTS. Offer Ends 11/5!! 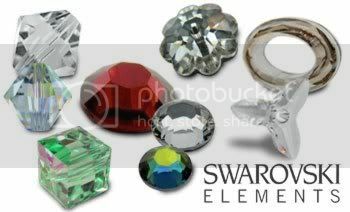 New SWAROVSKI ELEMENTS CYS Instruction Guide! The New “Ethnic Strings Collar” from CREATE YOUR STYLE WITH SWAROVSKI ELEMENTS This easy do it yourself instruction guide features the new SWAROVSKI ELEMENTS Spring/Summer Innovations! It utilizes the new Color Blends, New Gem Color Pearls, and the New Crystal Luminous Green Pendant! CLICK HERE for your FREE instruction Guide!! All Aboard! Swarovski's Create Your Style Cruise! Vote For Us on BlogTopList.com!